BLACKBERRY Rubus fruticosus White serpentine mines on Blackberry leaf (far left). Close up (left) shows a long snake-like larval gallery with dispersed frass (waste products). Commonly found. 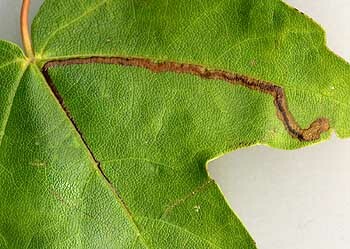 A micro moth larva Stigmella aurella. Scan: 28th August 2005 Very common in the forest. HONEYSUCKLE Lonicera periclymenum Start as a star shape gallery - frass in black lines. A tiny fly larva Chromatomyia aprilina. Photo: 28th Aug. 05. Near Roe's well. LONDON PLANE Platanus x hispanica Blotch mine on underside of leaf. Upperside of leaf folded. A micro moth larva Phyllonorycter platani. FIELD MAPLE Acer campestris Gallery with green frass. A micro moth larva Stigmella aceris Scan: 28th August 2005. CHERRY Prunus padus. 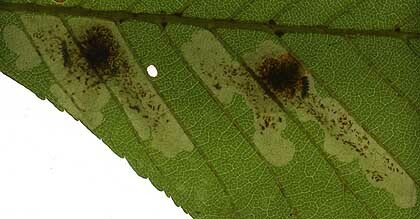 A blotch mine on the underside of leaf forming a fold on upper side of leaf (top). Mine dissected to show pupa (below). 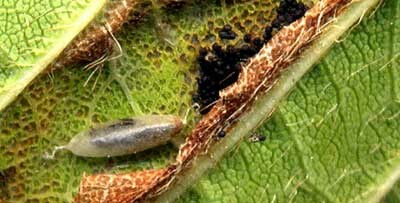 A micro moth larva Phyllonorycter cerasicolella. Scans: 4th October 2005 Found in the plantation. 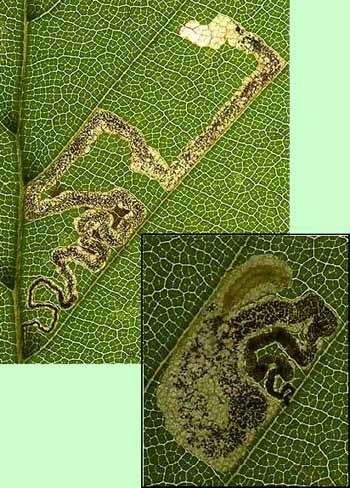 Snake-like mines between the veins in beech leaf. The frass is coiled at the start of the mine. 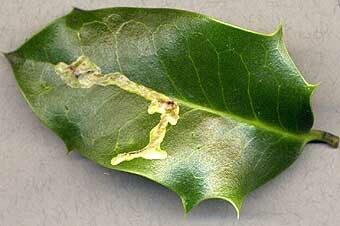 Inset picture shows a larva. Scan: 26th August 2005. HORSE CHESTNUT Aesculus hippocastanum A micro moth larva Cameraria ohridella A brown blotch mine (top). 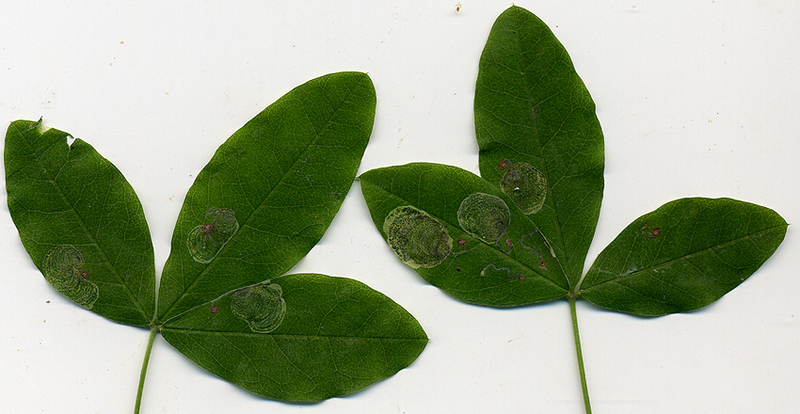 There can be several on each leaf/leaflet. Close up (below) shows two mines each with a circular mass of frass and both containing a larva. 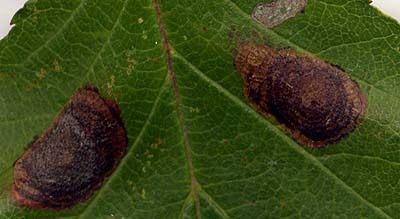 Commonly found in the forest on Horse Chestnut although only reached the UK in 2002. Scan: 28th August 2005. Hainault Lodge Nature Reserve. 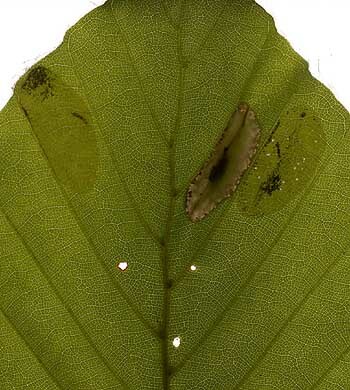 BEECH Fagus sylvatica A micro moth larva Phyllonorycter maestingella Blotch mines on underside of leaf. Scan: 26th August 2005. 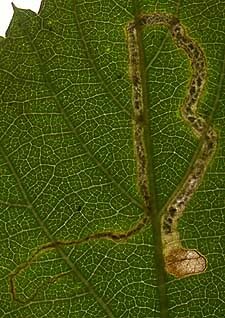 Very long mines on upper surface of the leaf, which follow the veins. There are several on the leaf above. Photo: 18th October 2005. Near the lake. 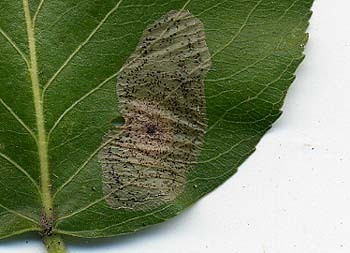 PEAR Pyrus communis A micro moth larva Phyllonorycter corylifoliella Blotch mine on upper surface of leaf. Scan: 27th August 2011. 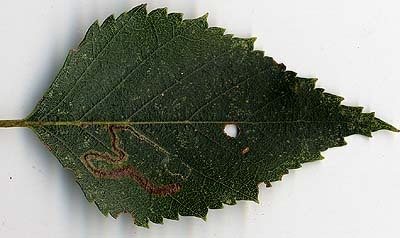 SWEDISH WHITEBEAM Sorbus intermedia A micro moth larva Phyllonorycter corylifoliella Blotch mine on upper surface of leaf. Left: An elongated mine, but often appears as a blotch. The larva has yet to emerge. Above left: Close up of mine showing successful emergence of the mining fly. 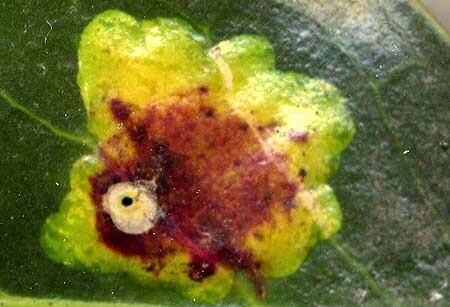 The emergence hole is roughly triangular on the top of leaf. Above right: Close up of mine showing the emergence of a parasite. 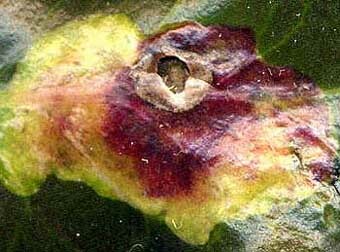 The emergence hole is a tiny pinhole on the top or back of leaf. Scans: 5th March 2006. Hainault Lodge.